When I heard that Star Wars Celebration would be held in Chicago this year, I was stunned. My second reaction was to immediately reserve a hotel room at the convention center. 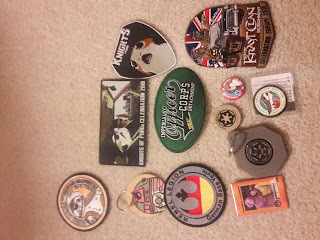 Since we're part of the local 501st Legion (the Midwest Garrison), there was a lot of planning to be done. Eugene and I helped with the local Galactic Academy school, which is a Star Wars costuming group for kids.We knew we wouldn't be able to attend all five days of Celebration, but we knew they would be intense. We knew we wouldn't be able to do everything. My personal goals were to be part of some of the group photos, see friends, participate in the Droid Hunt on Saturday, and meet Anthony Daniels (the actor who played C-3PO) so Alex could get a picture signed. (I would have loved to get a picture with him while I was in my Jawa, but no selfies were allowed.) Panels would have been nice, but the only one Alex was interested in was the Episode Nine panel, and we didn't win the lottery for that. Since we figured this might be a once-in-a-lifetime event for us, I took Alex out of school on Friday. My brother-in-law drove us to McCormick Place so we wouldn't have to park onsite. 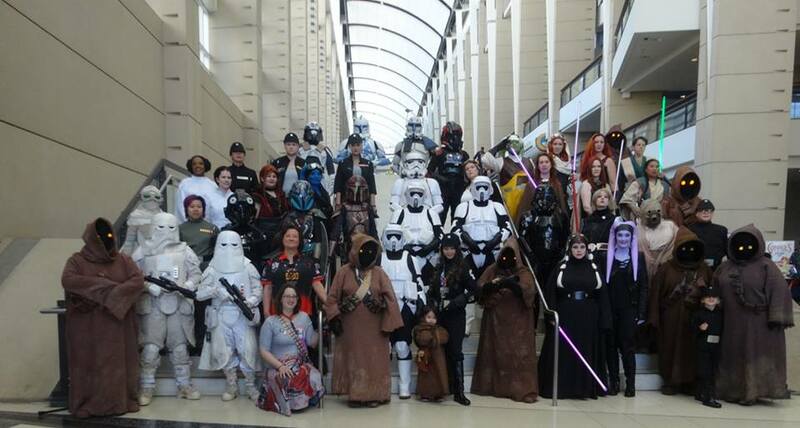 I was able to join the Ladies of the Legions (see first photo; I'm the Jawa with two bandoliers in the middle of the first row) and Krayt Clan group photos as a Jawa. I wasn't able to join the Imperial Officer group photo since we won the Hasbro lottery and had to go claim our stuff then. This was around the time the Episode Nine trail debuted, but we couldn't find a good spot to watch the screens on the show floor and settled for watching it later on YouTube. Alex and I spent most of the afternoon on the show floor, checking out the merchandise and admiring the exhibits. I wore my Imperial Officer costume, but despite trying to stretch my boots, they were still tight and hurt my feet. We left a little early to check into the hotel room and get dinner. When Eugene arrived with the rest of our luggage, we attended a swag trade for members of the official costuming groups. Each group issues a lot of special patches and coins, so we moved from table to table, seeing what interested us. Some of my crocheted characters found new homes that night as well. Here's a picture of some of my new swag, but Alex really made out. He found a few special patches featuring his red stormtrooper costume. The traders were more generous with the kids, but Eugene and I still had to donate patches from our stash to help him out. Saturday was the Droid Hunt, where attendees wear special patches and selected hunters try to find them. At C2E2, this is an individual event, without competition. Here, we got together in teams to win a medal. Our group didn't win, but I would still do it even without a prize. Partway through the day, Alex and I took a break to get in line for Anthony Daniels. We waited almost three hours. 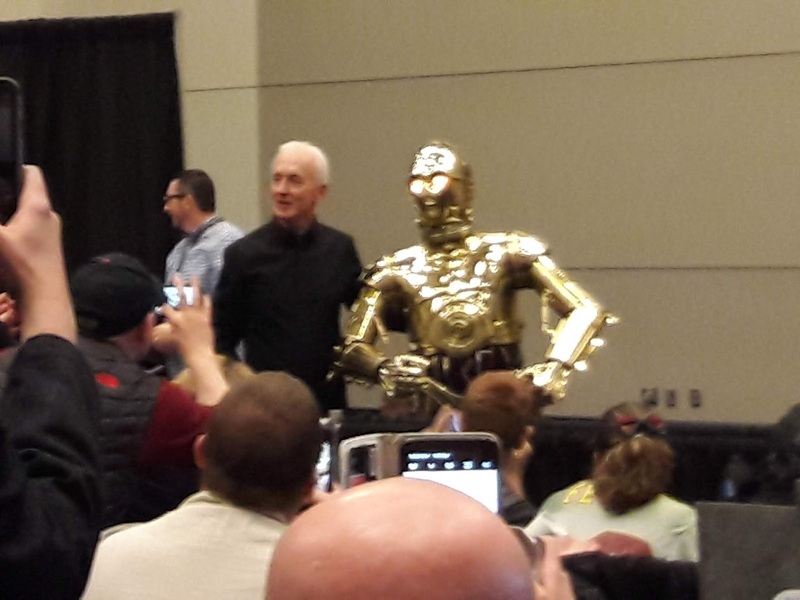 He took a break during that time, but he did come out and allow us to take pictures of him next to a C-3PO. I was still in my Jawa costume when Alex and I finally made it to the front of the line. Anthony Daniels said he liked Jawas (though his character might disagree) and told us a bit about the kids on the set. He asked Alex why he wasn't in costume and who was with him. (Alex's armor is too uncomfortable for him to wear that long.) When Mr. Daniels found out I was Alex's mom, he said I must be a wonderful mother with a great sense of humor. He also asked Alex how he felt about me dressing up, and he said it was fine. After Mr. Daniels signed Alex's photo, I offered him a C-3PO I had crocheted for him. Unfortunately, he wouldn't take it; maybe it's against his policy. I'll definitely keep this droid! By the end of Saturday, I was exhausted and ready to spend a couple of hours off my feet helping out at the Galactic Academy booth. We had dinner delivered and hung out in the hotel lobby a bit to meet other people before calling it a night. By Sunday, I was too exhausted to dress up again. We went to the Hard Rock Cafe for a special breakfast with the Galactic Academy. While we were there, Alex got to meet Walt, the man who made his magmatrooper kit. Walt gave Alex a sneak peek at a special, secret project. Even Eugene and I didn't know what it was. When we got back to the convention center, we wore casual clothes to wander around the show floor and the droid exhibit. This was the day I got to take pictures of other people suited up. While the movie-style costumes are always good, I enjoy seeing some of the creative mashups. 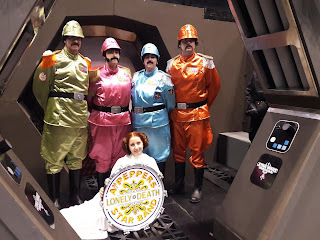 There were Sailor Scout Jedi, a Star Trek redshirt who'd been stabbed with a lightsaber, a guy as a bag of sand, Muppet Troopers, and my personal favorites, Sargent Pepper's Lonely Death Star Band. One of my friends was even an ice cream maker during the traditional Running of the Hoods (too bad I didn't get to see it in person; see the link for video). Although I was worried about the crowds, they weren't as bad as I feared. We tried to go in after show floor opening and avoided booths/events with long lines as much as possible. I didn't buy a lot at Celebration, since we didn't have a lot of room in the car. That was probably a good thing. One store was selling a Jawa doll for $12, but I found it at another place for $4. There were a couple of things that I was interested in, but they were significantly cheaper online. I did get a Porg flash drive and an exclusive T-shirt. However, I think the memories will be the best souvenir of all. Hidden Histories Anthology Available for Pre-Order! Third Flatiron Anthologies feature multiple winners of science fiction and fantasy reader polls and recommended reading lists. Hidden Histories is a new speculative fiction anthology with the themes of alternate and secret (shadow) histories. 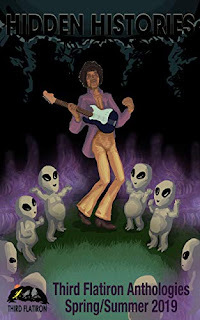 In Hidden Histories, agents of the ancient Library of Alexandria attempt to steer human history, a witch at the stake explains how she was framed, a missing airliner black box turns up, General Custer is defeated by wendigos, Queen Elizabeth tells Shakespeare she was cursed, a seance saves the Apollo-13 moon mission, an alien ambassador mentors Jimi Hendrix, a competing ship line plots to scuttle the Titanic, were-boars fight Nazis in WW2 Germany, the back room of a bookstore holds histories written in the future, and a girl learns the true history of Chinese dragons. These and many more stories entertain while exploring revisionist interpretations of real and fictional events. A. Humphrey Lanham. Edited by Juliana Rew. Welcome to April! It's starting to warm up around here (though not consistently), and plants are slowly regaining their green. Hopefully spring will be in full force soon. In the meantime, best of luck for those doing the Blogging A-Z Challenge! This would have been an ideal time to use a Star Wars costume theme, since we're going to Star Wars Celebration in Chicago in a couple of weeks. I still have so much to do beforehand, so it's good for my sanity that I lightened my blogging schedule. Speaking of blogging schedules, it's time for my monthly Insecure Writer's Support Group Post. You can learn more about the IWSG on their website, Facebook, or Twitter accounts.Our hosts are J.H. 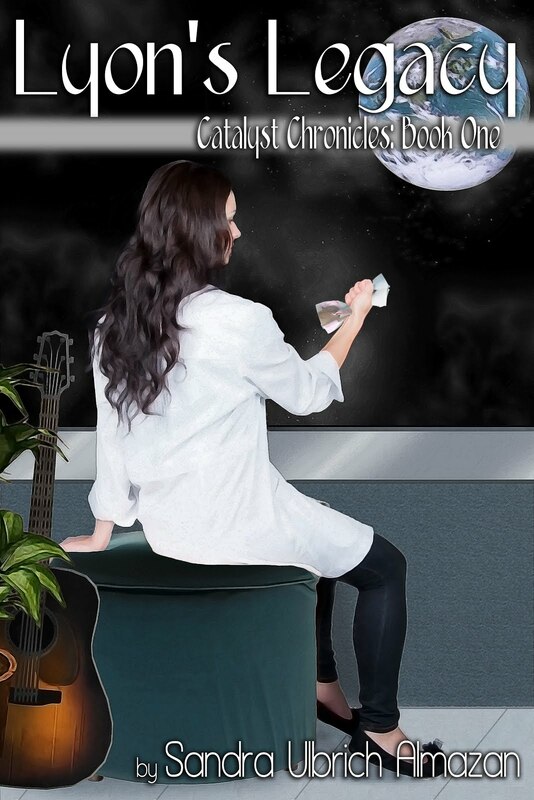 Moncrieff, Natalie Aguirre, Patsy Collins, and Chemist Ken. Our question this month is If you could use a wish to help you write just one scene/chapter of your book, which one would it be? As a pantser, I find this a difficult question to answer. I'm finally working toward the final act of Dryads to Discover. I know key events, and I also know how I want to end the book. However, I don't have this broken down yet into scenes and viewpoints. So, if I had to pick a scene to get help with, it would probably be the climatic moment when my heroes confront their foe. However, if I could get a general writing wish, it would be to have all the knowledge and research already done for my latest historical novel idea. What's your writing wish? Feel free to share it in the comments. 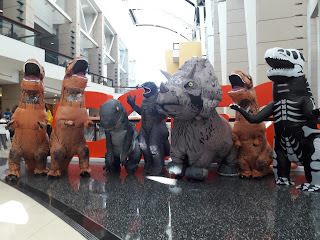 I have to admit I wasn't sure about attending C2E2 this year, since we're going to Star Wars Celebration in Chicago next month. However, when I learned Paul Rudd was going to be one of the guests, I knew I had to take Alex, who's a big Ant-Man fan. Alex is also on Spring Break, so he and I would be able to attend all three days. Friday got off to a rough start when Alex's badge came off his lanyard and was lost. Fortunately, although the event was almost sold out, I could still buy a replacement badge for him. (At least the kid badges aren't as expensive as the adult ones.) I dressed up briefly as a Jawa, but I spent most of the day going around with Alex on the show floor. There was a Dinosaur Parade scheduled for Friday, so I bought an inflatable costume so he could participate. 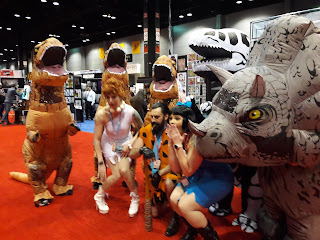 By a lucky coincidence, the dinos ran into a group of Flintstone cosplayers, so that made for some great photos. The best part was when the parade trooped out to the "C2E2" sign, and the DJ played "Walk The Dinosaur." Later that evening, Alex and I went to an autograph signing for Paul Rudd. It was a long wait. (I had enough time to almost finish crocheting a Porg, and we didn't get out of there until after the convention closed.) Paul Rudd was gracious enough to stay until everyone in line got a chance to meet him. I gave him a crocheted Ant Man I made last week, and he seemed to like it. Alex was also happy to get a picture signed. On Saturday, Eugene joined us and drove us in to the convention center. I wore my Jawa in the morning, and in the afternoon, I switched into my Imperial Officer for Droid Hunt. I spent nearly three hours walking the show floor, searching for people with special badges. (This is why I get my highest daily step counts at C2E2.) Even when I bought a pretzel and lemonade for Alex, I still encountered several people with badges. I also saw a couple of friends. Sunday was a more laid-back day. We did present a toy landspeeder to a non-profit organization in the morning, and afterward, I changed into my Jawa and walked around with a group of other Jawas, a R2-D2, and a Tusken Raiders. We were quite a hit. One of the garrison members has a new O-O-O (evil C-3PO) costume, so we also got to take pictures with him. Hopefully I'll get a copy soon. I didn't buy much at C2E2 this year, but I do have some good memories of it, and that's even better. What are your favorite spring-themed songs? Feel free to share them in the comments. As a Beatles fan, I always enjoy finding new books about them. 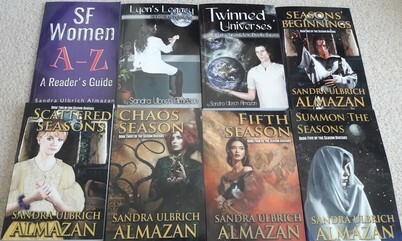 And if these books are written or edited by my friends, I have to help them get by, right? Actually, my Beatles fanfiction used to be on the e-zine Rooftop Sessions, which was run by my Beatles friend Susan Ryan. Unfortunately, I don't think the site is live any more, though you can learn more about it here and even access back issues. 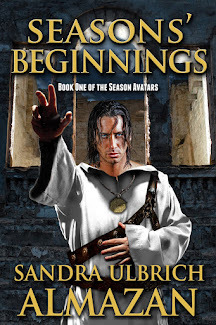 (You might even find very early versions of Lyon's Legacy and Twinned Universes, along with other stories of mine, through the Wayback Machine.) Susan's husband, Jim Ryan, was another contributor, and he recently collected some of his alternate Beatles stories in Alt Together Now: The Rooftop Sessions Fiction of James Ryan. It's been a long times since I've read them, but they include references to Live Aid, The Twilight Zone, Lord of the Rings, and Doctor Who. Sounds like a splendid time is guaranteed for all. 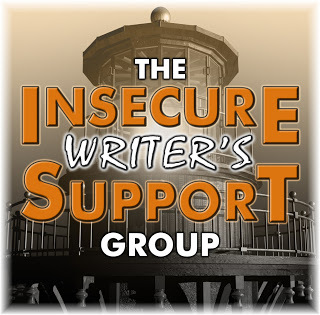 It's time for the monthly post for the Inscecure Writer's Support Group. You can learn more about them on their website, Facebook, or Twitter feed. Our hosts for March are Fundy Blue, Beverly Stowe McClure, Erika Beebe, and Lisa Buie-Collard. Our question for the month is Whose perspective do you like to write from best, the hero (protagonist) or villain (antagonist)? And why? All of my stories are written from the protagonist's perspective, though occasionally I'll include the antagonist's perspective. As a reader, I assume the first perspective I'm exposed to in a story is the protagonist's, so that's part of the reason why I use it more. Stories are typically meant to be a hero or heroine's journey, so it's helpful to follow their perspective to understand how the events in the story change them and help them develop. Antagonists generally don't develop at the same rate or fail to change; however, there are stories where the line between hero and villain can be quite thin. (Some stories make an antagonist from another story the hero, so you see actions from his/her perspective.) Another reason for not writing so much from the villain's perspective is to keep some of his/her actions secret so as not to spoil a twist. Sometimes I do want to show some of a villain's plans, but their scenes are far fewer and less extensive than the hero/ine's. Whose perspective do you like to write from? Is there a perspective you prefer to read? Feel free to share your thoughts in the comments.